Years ago, when I gleefully began using my mom’s garden for my own purposes I made the mistake of planting mint in it. Not only that, but so enamored with the different flavors available, I planted several varieties of it: chocolate mint, peppermint, spearmint and orange mint. I had started my own personal mint farm! I loved all the slight nuances of flavor in those little leaves, however in the end, I used very little of the flavored mint. Going through the garden, I loved pinching and rubbing the leaves between my fingers and smelling the wonderful scents that came off. Most of the mint that was used simply went to mojitos and when the season ended, we both assumed it would be the end of the mint. Not knowing any better, next year we were both surprised to find, “Oh wow- the mint came back!”…and it had spread. 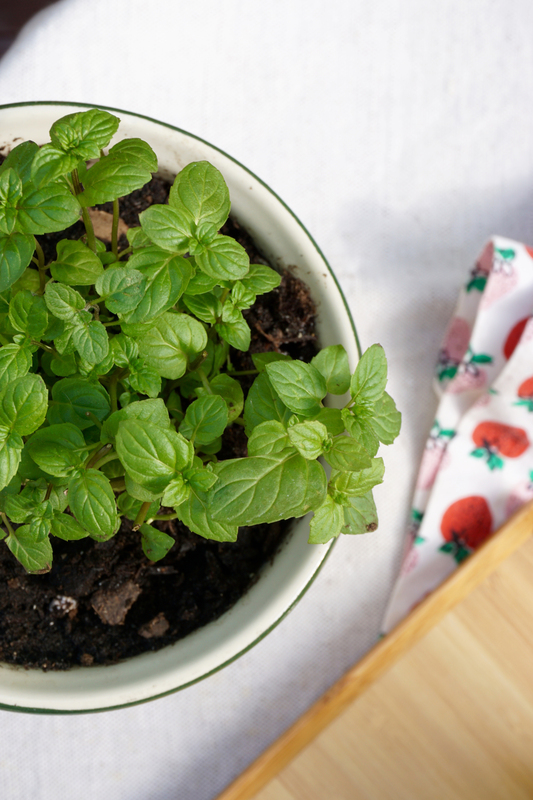 Most of the mint varieties had combined to create a muddy, minty taste and in the end we pulled up most of it, with the exception of one or two plants that still had good flavor. Each year since, it has spread its little tendrils out further and pops up in unexpected places, and each year we have tried to prune it back. I was only officially told this year that it functions similarly to a weed and that it must all be pulled out otherwise it will keep spreading, but a part of me doesn’t want it to all go away. I like the little surprises of mint that pop up throughout. This year however, the flavors have become less intense. With the help of Yotam Ottolenghi I’ve found many more ways of using mint. Because of that and also partially because I firmly disagree with the idea of paying for fresh herbs in the spring and summer, I found myself purchasing more mint this year (this time only in spearmint and peppermint, though as I talk about it more, I’m craving the wonderful depth of chocolate mint). I’ve learned my lesson though and this time around they have their own little pots to go into so no more spreading all around the garden! 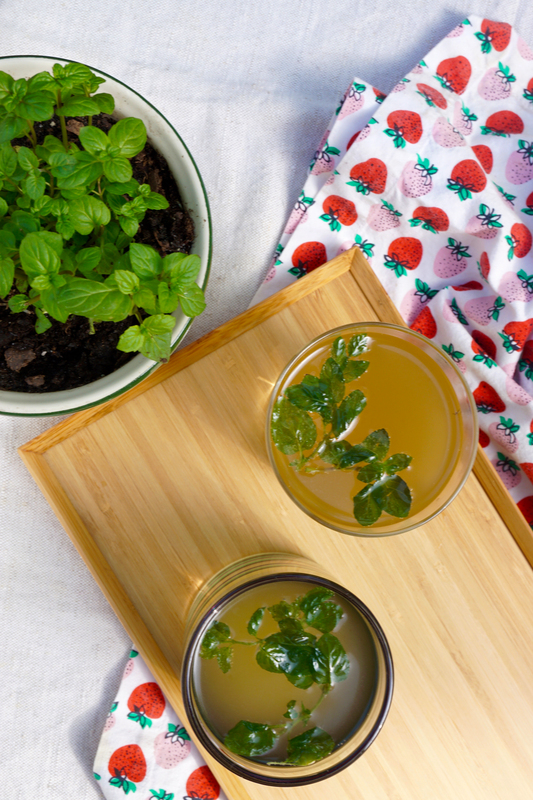 Inspired by the cold mint tea I would see at the greenmarkets in NYC, this recipe is just a simple way to use mint to create a refreshing drink. In a small saucepan, mix together the mint, sugar and water. On medium heat, simmer for 20-30 minutes, stirring occasionally so that the sugar doesn’t stick before melting. Turn off the stove and cover the pot, allowing it to cool completely (I often leave it overnight on the stove). 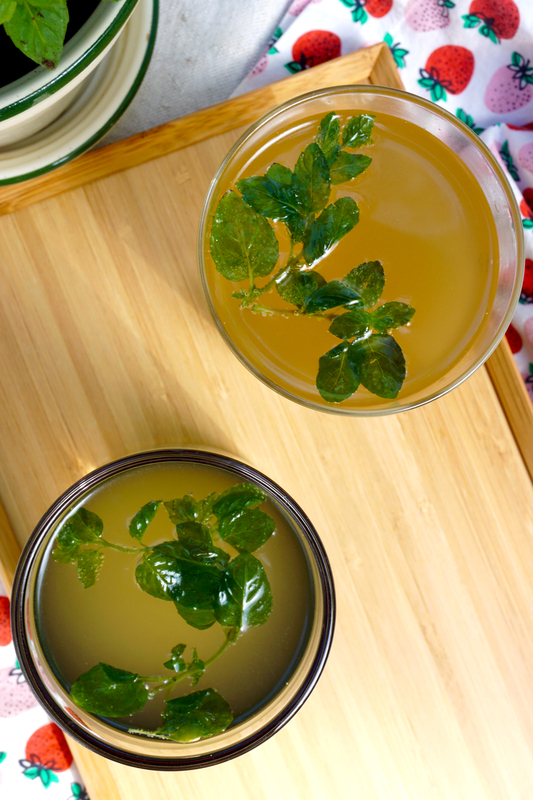 Strain the mint syrup and store in the fridge until ready to serve. When you are ready to serve, divide equally amongst 4 glasses and top with chilled club soda, to taste. If using, slice a lime into 4 wedges and serve with each drink. 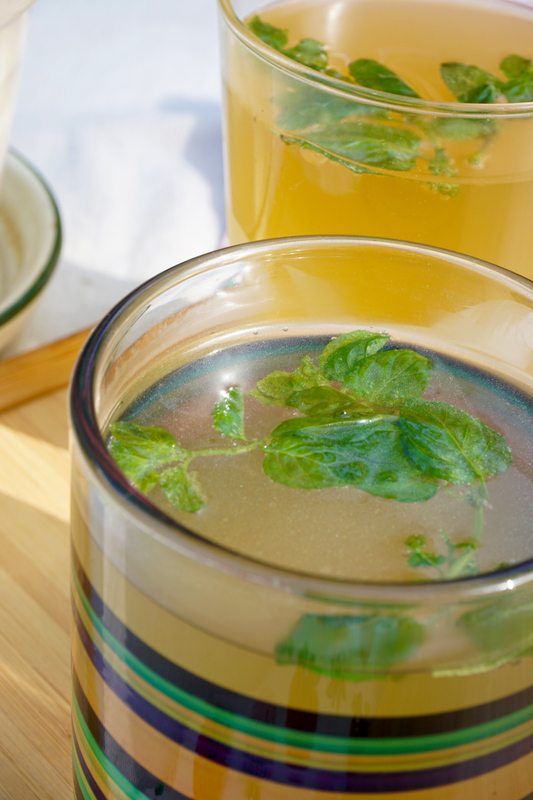 Tea with fresh mint is one of my favorite things. I haven’t been able to keep my mint thriving. It keeps getting eaten or isn’t in a spot that gets enough sun. (Apartment living) BUT I keep trying! This sounds wonderfully refreshing! Wish I could grow mint like you. Ours here in South Florida just withers and dies as it climbs into the 90s.